One of southern Sri Lanka’s hippest boutique hotels, Cantaloupe Levels, has been anointed one of the ‘Best Beach Breaks for 2018’ in the December-January 2017/18 edition of the traveller’s holy grail – the famed Conde Nast Traveller (India), affording the hotel pride of place with some of the best in Bali, the Maldives, Singapore, Indonesia and Thailand. Situated on the side of a steep cliff in Unawatuna, with sweeping views of the Galle Fort and bay, Cantaloupe Levels boasts a breathtaking infinity pool and overall architectural aesthetics. Designed in the style of a Miami beach club, the hotel lends itself perfectly to a long weekend with friends – with popular surf and party beaches a mere stone’s throw away. Finding mention in Conde Naste Traveller, Cantaloupe Levels successfully blended a beautiful and unique location to create a luxurious and contemporary space to emulate the unique island experience. Cantaloupe Levels reflects the brand’s creative bent and successfully blends the quintessentially classic with the elegantly contemporary. Awards and accolades have come thick and fast. Cantaloupe Levels was recognized by the World Luxury Hotel Awards with the prestigious title of ‘Best Luxury New Hotel’ in the Asian Continent at the awards ceremony held at Harbour Grand Hotel in Hong Kong in 2015. It was also recognised as the overall winner of TripAdvisor’s Travellers Choice award for the year 2016, thus recognising the team’s effort in ensuring each guest has an enjoyable and luxurious stay. The award is based on the reviews and opinions of TripAdvisor’s global travel community and is the highest honour given by TripAdvisor to the hotel chain. Cantaloupe Levels is a short drive from the World Heritage Site of Galle, up a winding road and boasts panoramic views of the history-steeped Dutch fort. It’s just over an hour and a half’s drive from the capital, Colombo and two and a half hours from the international airport, an ideal base for touring southern Sri Lanka. Owned and managed by Cantaloupe & Co, its young and dynamic management team considers Cantaloupe to be a lifestyle rather than a company, as each of its ventures exudes a unique vibe. Cantaloupe was founded with the intention of evolving into a lifestyle that carves out a niche market for individuals, who aspire to find a world where fantasy meets reality – aspiring to be the premier boutique hospitality group in the country. Cantaloupe began with designing spaces and operating venues and then ventured into hospitality. 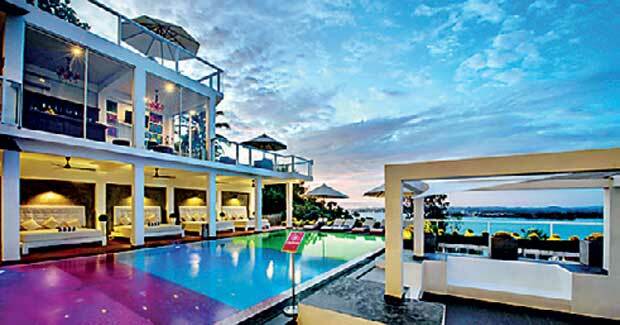 The group has two hotels, Cantaloupe Aqua in Talpe and Cantaloupe Levels in Rumassala, Galle. Cantaloupe Hotels will be expanding its concept further south to Midigama, Weligama where it will open Cantaloupe Soul Surf to cater to and develop the chic side of the evolving surfing culture in Sri Lanka. Fulfilling a long-felt need for a spectacular dining experience that blends exquisitely-prepared dishes, suitable ambience, lighting, music, great service and a cool vibe to perfection, Cantaloupe & Co. has to its credit, Botanik, the hottest bistro in Colombo. Botanik also found mention in the latest Conde Nast Traveller – The Gold List 2018. Located on the rooftop of Fairway Hotel in the commercial, tourist and historical Colombo Fort, Botanik is the perfect springboard from which to gaze out at Colombo’s rapidly rising skyline. Luxury lifestyle company, Cantaloupe & Co., is helmed by Founder/Managing Director Dmitri Jayasuriya and Directors Yasser Farook, Nadeem Rajabdeen and Nadira Jayasuriya.